The Blanchard Rock Shop is located on Highway 380, about 1 hour and 45 minutes south of Albuquerque, New Mexico, in Socorro County. It is halfway between San Antonio and Carrizozo at mile marker 30 on U.S. Highway 380, in the "town" of Bingham, New Mexico. Although Bingham has only 2 full time residents (no gas station, no restaurant and no motels), it is on the map and still has a lot to offer. Not only do we have rocks, minerals and related items for sale in the shop, we also offer a "local" rock and mineral collecting area along with guided mining tours/field trips throughout New Mexico. See our Virtual Fly-by video on YouTube! Click below! The "local" collecting area is located here in the world famous Hansonburg Mining District, which is also known as the Blanchard Claims. This district is considered one of the "richest" when it comes to the variety of mineral species it produces, which is over 80 different ones. In fact, the mines here have produced a number of world class mineral specimens which can be seen at several museums including the Smithsonian, the Kongsberg Mineral Museum in Norway and the New Mexico Mineral Museum. At this time, we have one mining claim open for public collecting and it's called the Desert Rose. The common minerals that can be dug here are Fluorite, Barite, Galena, Quartz and Smoky Quartz. The rarer species that can be found on this claim are Linarite, Brochantite, Wulfenite, and many more. We allow people to collect only on the surface, which includes both hard rock mining as well as tailings piles to dig through. The climate is conducive to year-round collecting, although some winter days are rather chilly and may have light snow. We do recommend that you call a few days prior to coming out to make sure that we are open and that the roads to the mining claim are passable. Also, if you need RV hook-ups, we can provide them. Besides collecting in the Blanchard District, we do offer field trips to other great mineral localities throughout the state. Most of these areas are under private ownership/claim and are not accessible to the general public. On these tours, you will be given a geological interpretation of the area, lessons on how to locate a mineral vein and/or pocket, hands-on instructions on how to properly remove the specimen(s) from the base rock and tips on how to clean and care for your treasures. Some of the rocks and minerals to be found are fluorite, agate, jasper, turquoise, amethyst scepters, gold and fossils. These trips are for everyone... from the serious collector to the novice rockhound. We do try to limit the tours to 6 people, but will make exceptions for large educational groups. Please try to make your reservations at least two weeks prior to the dates that you want. Absolutely no dealers are allowed! We are also happy to provide information on other mines and collecting areas throughout the state to rockhounds, free of charge. If you don't want to make the trip back to the mine, please stop by the shop and say "Hi!". The rock shop has been open since 1968, but since we've owned it, there have been many changes and improvements. It's not just a "rock" shop anymore. We have rocks and mineral specimens from the local Blanchard Mining District, as well as several other localities throughout the U.S. and around the globe for sale. Outside on the many tables, you can find agates, jaspers, petrified wood, slabs, geodes, and a variety of cutting/carving material rough. Inside the shop, we offer a large variety of fine mineral specimens, jewelry, rock digging tools, antiques, and mining artifacts. When it comes to the really rare stuff, we have Trinitite. This is the glass that was formed at "ground zero" during the world's first atomic blast! The shop is located only 16 miles from the Trinity site. We also sell rock cutting/polishing equipment. If you don't have the time to travel and see us personally, we do offer shipping and can send pictures of specimens via email. There have been many articles written about the mines and rock shop. The most recent was in the March 2002 issue of New Mexico Magazine, pages 30-35. 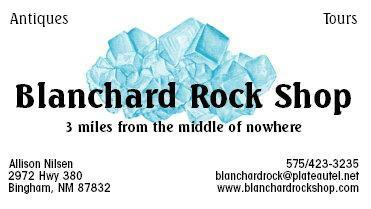 You can also read about us in most "rockhound guides" and "gem trail" books. We are open almost every day of the year from 9am - 5pm in the winter months and 9am - 7pm in the summer months, but as mentioned above please call ahead of time in case something has come up. This site last updated on Nov. 11, 2018.